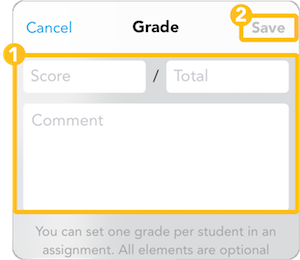 Adding grades to each student is a great way for your students to learn from experience. You can even add emojis to your grades so the limit the does not exist! You can add grades in two ways – in the assignment folder or while in the file viewer. In the file viewer, you can tap on the grade icon. Or if you’re in the assignment folder, you can tap on “+” and add a grade that way. Whether you’re using the iPad or the web app, the process is the same for both platforms. Fill out the pop-up to and then tap Save to assign a grade. Use emojis to add some zazz to your grading! None of the fields are required but filling out only the Total field won’t let you assign a grade.